Opinion At the core of the Wet’suwet’en conflict: How, ultimately, should resource development be governed? At the core of the Wet’suwet’en conflict: How, ultimately, should resource development be governed? Tyler McCreary is an assistant professor of human geography at Florida State University. Rick Budhwa is an anthropologist with Crossroads CRM and adopted into the Wet’suwet’en Gidimt’en clan. They both work with First Nations in natural and cultural resource management. 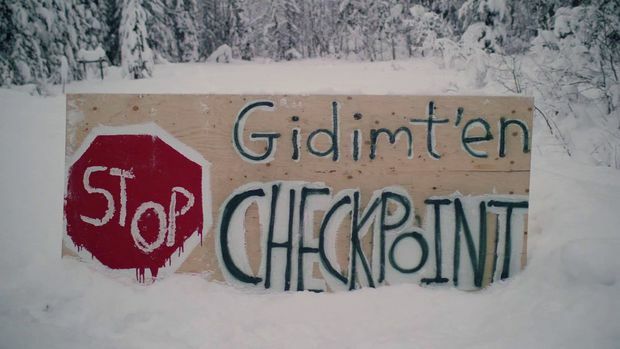 The Gidimt’en checkpoint on a forestry road south of Houston, B.C. Located in British Columbia’s northwestern Central Interior, the Wet’suwet’en have struggled for recognition of their territorial rights for generations and, more recently, have been at the forefront of pipeline struggles in Canada. The nation continues to govern the lands through matrilineal clans, led by hereditary chiefs each responsible for stewarding distinct territories and their resources. The historical precedent of separating First Nations populations from one another and from their traditional landscape continued this week, as it has many times throughout history. Prior to dismantling the Gidimt’en barricade, police constructed an exclusion zone, isolating the Gidimt’en, their allies and the media from broader networks of support. Similarly, arrested protesters were taken off the territories to Prince George for processing. The relationship between band and hereditary authorities is complicated, in part because the government and industry have consistently sought agreements with those most amenable to contentious resource development. Moreover, they are not acknowledging the important distinction between hereditary and band-level governance. Wet’suwet’en hereditary authority, embodied in titles passed down through generations, derives from the distinct relationship between a clan and its territories. In contrast, bands derive their authority from the Indian Act, originally created as a means for Canadian authorities to better control Indigenous communities. Elected band councils are responsible for the administration of band affairs, including education, band schools, housing, water, sewer, roads and other community services. Seeking clear recognition of their territorial authority, the Wet’suwet’en hereditary chiefs, alongside their Gitxsan neighbours, went to court in the 1980s. Claiming ownership and jurisdiction over their traditional territories, the hereditary chiefs took the stand and explained the traditions that gave them the authority and responsibility to steward the land. The Delgamuukw-Gisdaywa case would become one of the longest in Canadian history, demonstrating the depth and complexity of Wet’suwet’en governance practices. The court recognized that Indigenous oral history was a valid form of evidence of aboriginal title and accepted the standing of the hereditary chiefs as territorial-rights holders. Subsequently, the Wet’suwet’en hereditary chiefs have persisted in their efforts to have their territorial authority recognized, seeking to reach an agreement to share jurisdiction with provincial and federal governments. However, the province has been persistent that the Wet’suwet’en cede the majority of their territories to resource development. We must understand and accept that Wet’suwet’en hereditary law and culture, their beliefs and values, and their ability to maintain their identity as a people remain strongly connected to their territory. They actually have a word for it − yintah, which is the idea that everything is connected to the land. Wet’suwet’en cultural continuity is dependent on the sustainable management of their environment, and anything that threatens that will be met with resistance. The Wet’suwet’en hereditary chiefs have carefully considered all aspects of the Coastal GasLink project and have determined that it is not in their best interests. While Coastal GasLink violated Wet’suwet’en hereditary law by not obtaining the proper permissions to enter the territory, the company has followed provincial resource-management processes. According to the courts, the government’s duty is to ensure that development does not unjustly infringe on Indigenous interests. Provincial authorities need to account for, and in certain cases garner the consent of, impacted Indigenous peoples. Rather than trying to correct flawed resource-management regulatory processes, governments continue to use their ambiguity as an advantage. This must change if Canada is to keep its promise to adopt the UN Declaration on the Rights of Indigenous Peoples, which includes free, prior and informed consent. Ultimately, this conflict is over how resource development is governed on Wet’suwet’en territories. Without shared governance agreements on contested lands, key questions remain unresolved. Who are the appropriate authorities to make decisions? Who are they required to consult and what does that entail? When is consent from Indigenous communities required? The time has come to move beyond the politics of division and finally toward a just future. Until we meaningfully address these questions as a society, we will continue to see development decisions made through barricades and police rather than democratic processes, with Canadian politicians speaking out of both sides of their mouths with regard to reconciliation. As rallies take place across Canada and internationally to support of Wet’suwet’en clans, we must match our intentions with action. The world is watching. ‘I’m here in support of the Wet’suwet’en people’: Portraits of protest at the anti-pipeline camp in B.C.